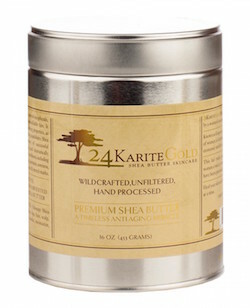 24 Karite Gold Wild-Crafted African Raw Shea Butter 16 oz. 24 Karite Gold Wild-Crafted Raw Shea Butter is unfiltered, fairly traded and hand-processed by a women's cooperative in West Africa that provides fair wages, community empowerment and uses sustainable harvesting methods. This superior Shea butter offers unparalleled moisturizing and soothing properties as well as inherent sun shielding capabilities. It's also never refined, heated to high temperatures or exposed to harmful chemicals. Consciously-sourced, this high-quality Shea butter is easy to apply, effective and addresses skin imbalance and irritation.